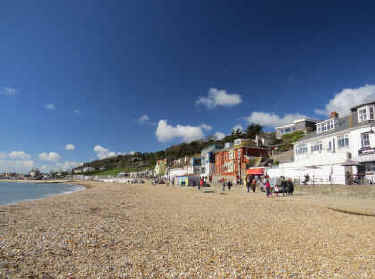 Lyme Regis is a small, picturesque town overlooking Lyme Bay which is popular with visitors all year round. Charmouth is a small coastal village nearby with good access to the beach and sea. Both places can easily be visited via the A35 Honiton to Dorchester road. 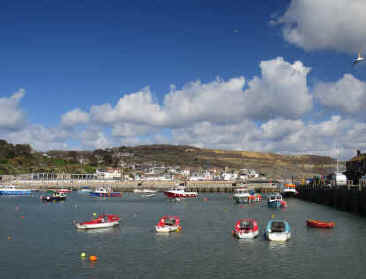 Lyme Regis is small, with a population of around 4000, but perfectly formed, as the saying goes. Situated on the border between Devon and Dorset the town encompasses features form both counties. The bustle and jolliness of Devon and the peace and tranquillity of rural Dorset. The seafront area is fairly small and is dominated by the famous Cobb, the defensive wall which juts out to sea and protects the small harbour. Quaint buildings abound and add an air of faded glory to this modern resort. In contrast the beach area is large and stretches away from the town in both directions - there is plenty of room for everyone. Both beaches are pebbly however but with a small area of sand nearest to the town. 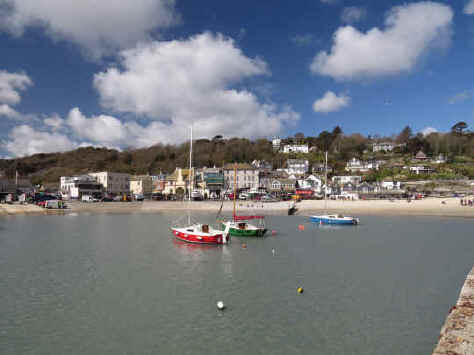 There are plenty of shops, pubs and cafes to cater for all of the visitors, and there is a good variety of food available - we can personally recommend a crab baguette with assorted leaves and lemon juice plus a bottle of local ale - ideal! Lyme Regis is a popular resort and parking can be problematic at peak times, explore alternatives! The beach area gives access to limestone cliffs which are the other source of fame for Lyme Regis. These cliffs are the source of many fossil and are the location of some of the largest dinosaur fossils to be found in Britain. This area lies within the Jurassic Coast World Heritage site which has now been designated by UNESCO. It is relatively easy to find common fossils in the area but do take heed of all warning signs, as the cliffs are constantly crumbling. Guidelines regarding fossil hunting are posted on the beach, please take note. The South West Coast Path runs along this section of coast and there is some excellent walking from Lyme Regis towards Charmouth and Bridport to the east - check tide times if you're going along the beach! Charmouth nestles between the sandstone cliffs of the Jurassic Coast a couple of miles to the east of Lyme Regis. It is a popular spot with visitors who come to visit the beach and the adjacent cliffs, which are a source of fossils. It is fairly easy to find common fossils along this coast but do take note of the local code of practice, for your own safety and to protect the Jurassic Coast, which is now a World Heritage site. You can hire geological hammers in several shops near the beach. There is a visitor centre at the beach with information on fossils and the Jurassic period of history. The centre also arranges walks with wardens who will tell you about the area. See link below. Also nearby is a cafe, shop and car park. There is a path up the cliff towards Golden Cap, the highest point on the south coast and onwards towards Seatown which also has a good sandy beach and ample parking (plus a nice pub!). The Town Mill - a restored water mill dating from 1340. As well as the flour mill there is a art gallery, cafe, studios, a bakery and a mill shop. The Lyme Regis Philpot Museum - Houses exhibitions about fossils, the town and the sea. Mary Anning - the famous female fossilist was born here in 1799.